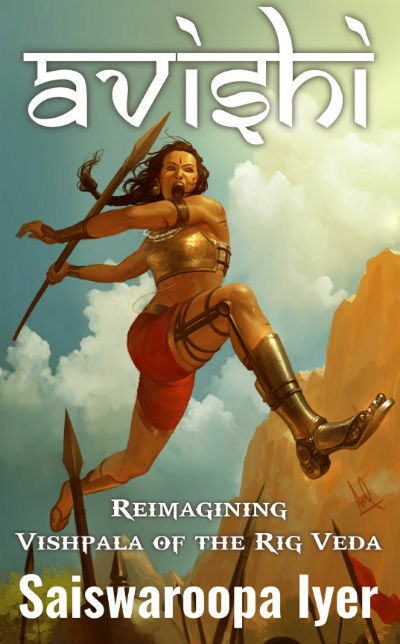 Saiswaroopa Iyer has started her journey as an author with Abhaya: The Legend of Diwali (Narakasura Vadha) Reimagined. Rather than going with the traditional book publication path she went ahead self-publishing the book on Amazon. And thus, only kindle edition of the same is available so far. With the commercial success of the book, she was encouraged to pen down more books and her next venture was “Avishi: Vishpala of Rig Veda Reimagined“. By the way, she has recently come up with a new book “Mauri” which is a sequel to Abhaya. We’ve bought Avishi: Vishpala of Rig Veda Reimagined during a promotion on Amazon India and were curious to publish its review but somehow the things were delayed. Fortunately, I got a chance to read it from our team and thus decided to publish a review of it without any further delay. So, here we go. Let us start with the book cover. It would be interesting to know that Avishi is referred to as the first case of an artificial organ implant and is found mentioned in Rigveda. She was a warrior. So showing a warrior lady with a Jaipur foot (which was not so much sophisticated, of course) is the right idea of the cover page. And, we can say that the cover page reflects it quite effectively. The color scheme chosen is attractive and simple. The cover page is made without using too much of the bright colors and with convincingly prepared illustrations. Also, the fonts used for the title requires a special mention. Anirudh Sainath (Molee Art) requires special appreciaiton for the cover page art. The book explores an imaginative story of Avishi, the protagonist whose reference is found in Rigveda, the ancient Indian scripture. In addition to have the well-explored character of Avish, the book introduces you to the fictional characters of Satya, Shula, Shivani, Archismaan, Khela, Shankha, Medhahuta, Anudatta, Vrika, Kukkura, Sharduli, Purandhara, Hala, Subahu, Guha, Challi, Prahasta, Maharshi Vahni, Shrutisharava, Tunga, Bhanu, Swadha, Ashwini kumaras (Ashwinas), Rishi Jatila, Sukratu amongst others. It was the time when the code of conduct approved by the council of the hermits and scholars living in the forest of Naimisharanya was respected and followed by the entire Jambudwipa. Of course, small villages, big cities, kingdoms and other similar social and political groups were in those times. The council of Naimisharanya keeps updating the code of conduct with changing times at regular interval. The council took care of spreading the updated code. And yes, the council has a wide network of Spies in the disguise of Rishis and is a very active one. The lust and desire for power, authority and wealth are not new for mankind. During those times also there are rulers who considered themselves as a king and eventually wanted to bring the entire Jambudwipa under his power. And to do that he does the things which are against the code of conduct and even humanity. Who is this king and what is he doing? Where does Avishi come into the picture? How she lost his leg and how an artificial leg is prepared and attached to her? You can get your answers in the rest of the book. Saiswaroopa did a nice job as the author of the book. She is in the complete control of the story throughout. Of course, it is a fictional tale which has a reference to ancient scripture, but if the story doesn’t found convincing that no one would like to go for that right? As far as my views are concerned, the author hit the bull’s eye, or at least the inner circle of the cardboard for sure. The characters are well developed. It is not easy to imagine the ancient times. Contrary to modern beliefs, it was the time when polygamy was not a taboo. In fact, it was considered as the way of living! Actually, the family system started being developed, so the rules or shall we say the conducts to follow are simply being developed. So, if you have rigid orthodox beliefs, it is quite possible that you may find some of the stuff a little offensive. In fact, the book has a long discussion thread discussing monogamy as the way of living, which is a kind of unique thing to find in modern literature. While the book discusses polygamy and having a free and unbound life, the discussion maintains a dignity and doesn’t go vulgar or titillating. I consider it as a success for the author. I also like the way the warriors are portrayed. There is no gender bias throughout. And, more importantly, the author doesn’t represent any wrong idea of feminism. Feminism is possibly the most relevant topic these days, the problem with it however is, it is a highly misunderstood concept. The book has a female protagonist who is saved (when was a kid) by another female who dared to fight a beast! So there are strong female characters. In fact, the protagonist is a female. The main antagonist is a male. However, it is represented so nicely and effectively that you never come to notice the gender of the character. There is no male bashing as well. So, the book is a nice read in the way that the characters represent their characteristics as expected. Sridevi Datta’s editing makes the story a smooth and fast paced ride with least number of bumps. I also like the way the places are explained. From the village to the king’s palace, from the forests to the war zone, everything is so nicely explored by the author that you can almost visualize things while reading the book. The use of words like Ganapati, Ganamukhya, Samiti, Senani, Rishi, Vishpala reminds of the ancient times where the story is placed. And, at the same time words like doctor, king etc. are to make the things easy to understand. The jungles of Naimisharanya and Dandakaranya will remind you of the geography of the time the story is set up. The people used to refer Gods like Mitra, Varuna, and others during those times, which is found in the book also. For those who don’t know, Mitra is a name for the Sun god and is used in one of the Sun Salutation mantras. So, if you are slightest aware of ancient Indian scriptures, you will find the book more entertaining. Those with large hearts take risks for others, not because they see others deserving it. But because they see it as right. A tigress attacked by a pack of lowly hyenas too might need… I mean deserve a hand in to eliminate the hateful beasts, chief. The more heat the metal is exposed to, the stronger it becomes, Satya. She buried her head into his chest brushing away the merciless weight of being a Ganamukhya. The harsh reality of wars and the way the warrior needs to prepare for the same is explored quite interestingly. Expecting fair treatment in a battle is practically throwing yourself under the mercy of the opponent. Desperation is often an opportunity. Frantic soldiers can win a losing battle if they are desperate enough. The following lines in the book are, I think most of the readers will be able to connect with. It is intriguing, how a person’s virtues are suddenly realized when he or she departs. The same virtues go almost unrecognized and without being acknowledged all life. It is a harsh reality indeed. The importance of the spies was recognized by the people of those times as well. In fact, the author mentions the most required attribute(s) of a potential spy. Rajan, a spy’s appearance as well as demeanor have to be in such a way that he looks like the last person in the world to be entrusted on a strategic mission. The beast was astonishingly noiseless for its size, but in the hour of twilight before the fast approaching daw, its gleaming eyes gave its presence away. Combat requires your brains too. Go easy, he is not your kill. But be it love, or war, the moment of the strike counted. Work and responsibilities needed to know their limits. Love is a mystery. It can estrange a childhood friend on one hand and make a stranger feel one with the soul. A union does build on dissimilar characteristics, but only when they complement each other. Not when the couple considers each as an affront to the other. Give up what pleases you for what prevails. You shall prevail. The time was ripe for the hunt. Don’t I hunt? And am I not gentle? And here is the wisest line from the book, which we can implement in any segment of life, any time. Before introducing new codes, let us ensure that the older ones are implemented. Relax. A duel is I what I meant. Caught unawares even before he could savor the full moment of unexpected victory, Vrika’s face fell as he collapse to the ground. Some lines have full stop missing and some of them looks like they are incomplete. The author could have written them in simple sentences to make it more effective. Like many other (especially Indian) authors, Saiswaroopa also used the word “Anyways” in the book, which could have been avoided. In terms of scenes from the book, I’ve tried to keep away as many spoilers as possible and thus I need to restrict myself from mentioning some scenes which I otherwise would like to talk about. A detailed glossary will make the book even more effective. If you love exploring mythology, you will enjoy reading this book.